Have you ever noticed how sometimes someone's perfume is so strong you can still smell their perfume even after they leave the room? Our "parfums" don't do that. Subtle yet effective. 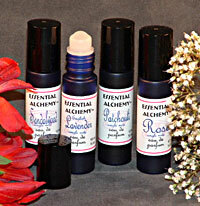 These perfumes are made using only pure essential oils & absolutes in a base of pure grain alcohol. Available in a spray or roll on. 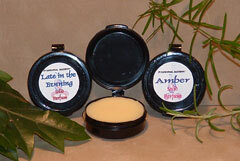 - The rich mild spicy scent of rock rose with the euphoric scent of clary sage leaves you smelling and feeling great. 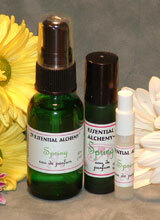 - This blend is based on an ancient recipe the Egyptians used in an incense to honor the sun god Ra. Cinnamon leaf, rosewood, myrrh, juniper, cypress, and other essential oils are combined with honey absolute to give this natural perfume a rich and lasting scent. - This parfum is made from the three oils that come from the bitter orange tree: bitter orange oil which is expressed from the peel of the fruit, petitgrain which is distilled from the leaves and twigs, and neroli or orange blossom, the most precious, which is distilled from the blossoms. This combination leaves you feeling uplifted. - The essential oils used in this parfum are blended together, for the purpose of helping those who wear it, to work with the principles of simplicity. However you wish to simplify your life, the scent of bergamot, black pepper, cedarwood, lavender, and patchouli essential oils with frangipani absolute will help. - It is the season of rebirth; the oils used in this parfum help to create that feeling in you regardless of the season. Blood orange, cedar atlas, clary sage, geranium, and ylang ylang blend beautifully to uplift your sprits and give a euphoric effect. This deep woodsy blend of sandalwood, rosewood, cardamom, patchouli, and ylang ylang extra essential oils in grain alcohol can help create a relaxed and intimate feeling. A convenient way to add scent all day. These solid parfums are small enough to carry in your bag. Apply to pulse points or anywhere you apply your parfum.